I’m doing a “Countdown to V-day” series of daily blogs to give you gift ideas for Valentine’s Day. And this idea comes from The Garage. No, not the one you park your car in. I’m talking about the one that’s located in Madeira and specializes in massage and body work. My husband has rheumatoid arthritis, so his joints are always achy and painful, which causes his muscles to tense up into knots. So, I like to give him massage gift certificates every now and then to help him relax. For special occasions, I’ll buy a couple’s massage so I can get in on the pampering too. So, for our two year anniversary in September, I got a couples massage gift certificate for him at this new place called The Garage. I liked that it wasn’t a “fru-fru” girlie smelling/looking/feeling place… it’s more masculine than any spa I’ve been in … so it makes a guy feel very comfortable there. What I liked about it is that you could customize the scent and music you wanted during your massage. I love lavender, and I know it helps with relaxation, so I picked that as our scent. And I also chose “The Fray” as our music because “I’ll look after you” by The Fray was the song of our first dance at our reception. When it started playing my husband looked over at me and tears welled up in his eyes. That was a really special experience, and I thank The Garage for making it possible! I highly recommend getting a massage here, especially if you’ll be bringing your guy with you. He’ll feel very comfortable there. And you’ll love it because of all the customizations. Ask for the owner, Onalda, if you call (513.235.0566), she’ll take care of you. They have this promo going for Feb: Book 60 Minutes at reg rate and get 30 minutes free-Valid through Feb. 28th. 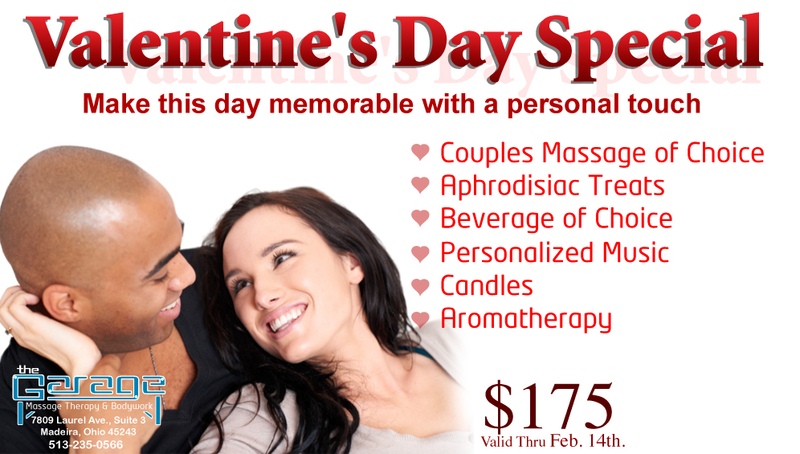 And for Valentine’s Day they have a couples massage for $175 (see below for what all is included) if you book before Feb. 14.